My big project this year is to get a DEC 340 monitor working. Here is a picture of one of them. 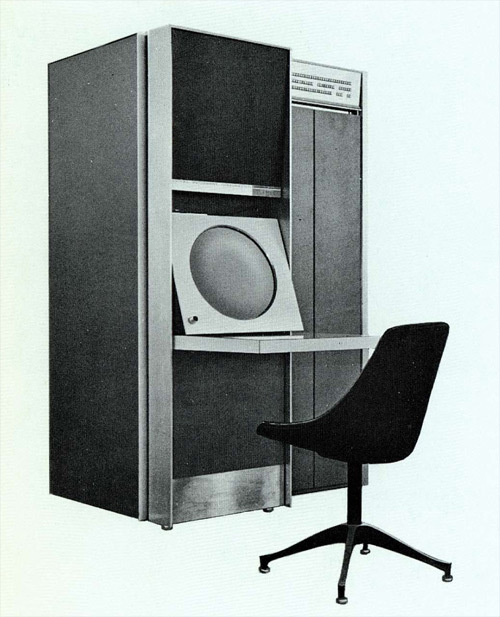 The DEC 340 was a very early and rare computer monitor dating from the mid 60’s used of course, on DEC computers, their PDP series. Two cabinets of rack mounted electronics. The 340 is historic and was used in some early work that pioneered modern computer graphic techniques. 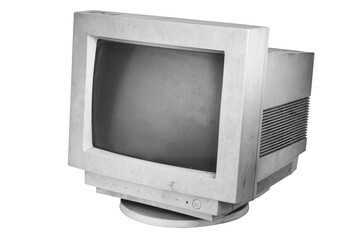 It is quite a bit different from Cathode Ray Tube (CRT) monitors used by personal computers we were all familiar with a few years ago. In comparison it is alien technology. All circuits are implemented using discrete components and there are no integrated circuits anywhere in the design. The discrete components themselves are unusual dating from the early days of transistor use. The DEC 340 I have to work on is missing the cabinet on the right. It seems to have been lost in the sands of time. The cabinet with the big tube on the left is the one we have. It is covered inside and out by a thin layer of rouge desert dust. A peek inside the cabinet and the dust suggests our DEC 340 could have crashed onto the desert outside Roswell, New Mexico as part of a flying saucer or come from the surface of Mars as alien technology. My peek inside had looked strange, alien. It took me a few moments to understand what I had seen. Then I had an a-ha moment. I realized this is how DEC computer engineers of the time did analog electronics. Everything is packaged the same way discrete digital circuits of the day were, as digital circuits of the time had to be connected together because of their complexity and size. Circuit cards of components in racks of connectors connected to back-planes carried buses of signals in digital circuits but analog signals may not like the same kind of connections as digital connections do. They may require different considerations. I’m not used to seeing analog signals jumping from place to place as if electronic noise did not matter. I can’t be critical because DEC 340 analog electronics obviously worked, but path length is usually kept short when making analog connections. This keeps noise pick up to a minimum and signals clean. I was surprised by what I saw in the 340 but DEC did not make radios or TVs. DEC built computers and I figure their engineers had to do things a certain way. Maybe even if they knew better. The layout which to me looks odd must have made somebody happy. Having all the electronics which connect to the CRT at least be in the same cabinet seems to have been the only concession made to analog design considerations but since it worked that’s OK. Scrounging for documentation I found that DEC had used the same CRT in other monitors and essentially the same drive electronics on the tube itself, so whatever problems they had only needed to be solved once. That was a good discovery, some of that documentation helps me out. Our 340 is incomplete with parts missing and actually came from a junkyard in Australia where it had been sitting outside for a while. Arid conditions somewhat preserved this DEC 340 but sadly it is incomplete. Our 340 is a carcass of missing pieces and this incompleteness enhances the feeling it is something from another world. Original components to build up missing circuit boards and for repair of circuits we have can not all be found. Old components are often not made of the materials modern components are and sometimes they do not age well. Arid also does not mean it is always dry. We have the magnetic deflection yoke and tube. Essential parts which I can’t re-manufacture. But an entire cabinet of components is missing. Racks of digital circuit cards which made the DEC 340 a processing device all on its own. Circuits which offloaded details of drawing from the host computer to which it was attached to lighten the host processing load. For these circuits we have only paper documentation. Output from the missing circuits drove circuits which controlled a big round sixteen inch radar CRT around which the DEC 340 was built. These circuits I have because they are analog circuits that were mounted close to the display CRT to minimize electrical interference. These circuits were in the same cabinet as the CRT; the only cabinet we have. Within the cabinet the analog circuits were implemented using Digital Equipment System Building Block technology where space allowed. System Building Blocks, are circuit boards mounting discrete components with a heavy duty 22 pin gold plated connector on one end to create a ‘block’ that can be used to build a ‘system’. The three sides without the connector are wrapped by an aluminum band. System Building Blocks plugged into a rack mount which could hold up to 25 blocks. Twenty five side by side connectors were interconnected on each rack mount to create a back-plane which resembled the way typical computer circuits of the day were implemented. That resemblance aside, System Building Blocks implemented both analog and digital circuits in implementations which today would be called ‘mixed signal’. Here is one of our modules with dust gently brushed off and blown away by compressed air. The transistors and diodes used in these circuits became obsolete long ago. Some were made of germanium which was only used as a semiconductor material in the early years of semiconductor electronics. Silicon is used almost exclusively as a semiconductor now. Silicon is a superior semiconductor for common uses, but in the early days of transistors. Germanium was a semiconductor of choice. 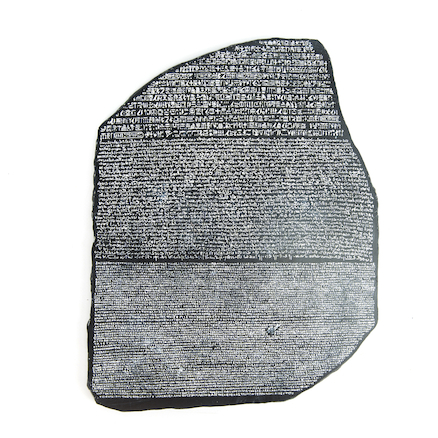 Techniques for working with silicon had yet to be perfected. I can get vintage germanium parts but they are expensive and hard to find. The numbers on the silicon transistors used I have not seen before. 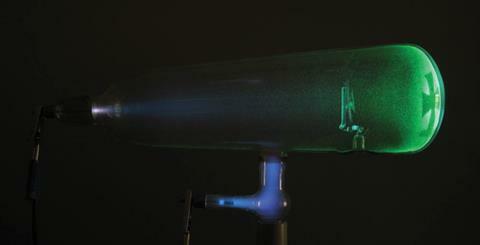 The vacuum tube era had just come to an end when the DEC 340 was built. Transistors were new and the ones used in the DEC 340 became quickly obsolete and are uncommon. I would have to pay a lot for replacements, those I could find. There are vendors who specialize in old parts. They don’t have everything. I would have a great deal of problems replacing components with original parts or parts with even similar specifications. Diodes this old when put on a curve tracer can sometimes look more like a resistor than a diode. Gray corrosion coats component leads. I am concerned about the diodes and transistors which have leads that were not gold plated. The hermetic seal on some of those components is sure to have failed. The plating on the steel rack which holds the circuit cards shows spots of corrosion documenting that condensation has visited the components. I only have one rack of circuit cards that contain System Building Block cards like that shown above. These circuits control to the CRT. All of the other electronics are missing. An entire cabinet full of card racks. All the signals to the cards I do have came from this second cabinet of cards that I only have paper documentation for. A second rack mounted below the first was cooled by forced air and is show here. The components on this rack are part of System Building Block schematics with components too big and which ran too hot to be mounted onto System Building Block circuit cards in a rack that takes thin plug in cards mounted side by side. Shown here are these two rack mounts removed from the cabinet they came in. A patch panel which jumped wires to the CRT from these racks is also shown. 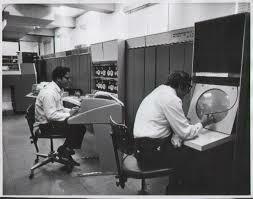 It was mounted in space inside the cabinet behind the racks and holds components on the other side. So what to do? My first decision upon reviewing the documentation and physical parts I had was to decide to reproduce the electronic circuits using modern components on new circuit cards. I might enjoy getting the original electronic circuits working but it is too risky and I do not have them all to begin with. I look at the glass diodes on the circuit cards and cringe. I don’t trust any of them. They have experienced morning dew and have corroded. We already know that the glass seal on old diodes can fail with time and a desert is not needed for that. Even if the diodes work I’d not trust them to keep working for long. Working on stuff knowing replacements are not available is scary. I would not want to plug in a one of a kind circuit and see smoke. I also know that the traces on circuit boards this old lift very easy so it is easy to damage these circuit boards when changing components. Even a little heat can turn circuit boards this old brown and lift traces. Reproducing the function of all the original circuits seems my best path. I located schematics for all the circuits so I can understand how they work and work together. My goal is to get the big radar tube working as it once did. Accomplishing that task using modern components based on original schematics will be fine and if something burns up I can replace it. Had the whole 340 made it to the desert to be found I might have decided to get the old circuits working and scramble for parts but with half our 340 missing, building all the electronics from scratch seems the best way to go for my best chance of success. That the DEC System Building Blocks were made using a proprietary connector has no small influence on my decision. I can create work alike versions using printed circuit cards which plug into easily obtained edge connectors but mixing and matching that arrangement just to accommodate the few System Building Blocks I do have makes no sense at all. It will be far easier to rebuild everything around a common connector that I can get than to rebuild the back plane using half new and half old parts which are actually incompatible in physical size to begin with. Another consideration is the issue of interface. The original System Building Block circuits interfaced to DEC equipment logic levels which range from ground to a negative voltage. We will be implementing the DEC 340 logic functions using modern technology which uses logic of a positive voltage, so I need equivalent System Building Blocks which interface to positive voltage. None exist, the only way I am going to get those is if I make them. A level of voltage translation circuitry between existing cards might cause timing problems best avoided. Another reason not to use the cards I have but to make work alike copies is the extra work of translating voltages cancels out the cost and work of reproducing circuits with voltage translation built in. As will be explained in basic operation, for its time, the DEC 340 was a high performance device and I must pay close attention to timing requirements. Will it really be a DEC 340? Yes it will. The tube will be original or an original replacement (I found one at a surplus store) and the deflection coil, which drove the tube, will be original as there are no replacements for that anywhere to be found. Function of the original DEC 340 will be achieved in a work alike reproduction driving an original tube. The electronics will reproduce the function of the original and if parts fail, replacements will be available. This article introduces my big project for the year but I have been working on it for a while. I have been creating schematics of the circuits I need and have been planning how it all goes together. I have been buying parts I know I will use. My original plan with this blog post was to write about the circuit on the 1575 System Building Block I show above. It is a fascinating and interesting circuit that I had to understand in great detail to implement right. I can base my circuits on original circuit topology and honor the basic method and forms but using new components with characteristics that don’t match exactly means I have to check that all the math works out right. This changes the values on some resistors and capacitors, so components are biased correctly. I simulate the circuits in a circuit analysis program so they have the best chance of working without needing later adjustments after I build them. I could not write about the 1575 System Building Block circuit without introducing my project. I still need to describe the basic operation of the DEC 340 before discussing the operation and function of the 1575 circuit. Understanding a circuit is a lot more fun if you know what it is used for. I find it can make the difference between being fascinating and boring, though the 1575 circuit is fascinating on its own. 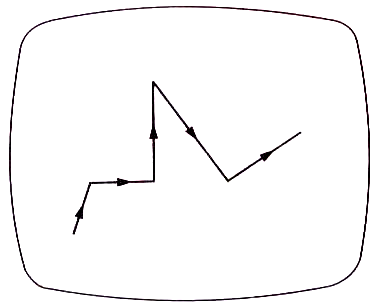 In my next blog post I’ll describe basic operation of the DEC 340. Eventually I will explain what Q4 and Q5 do in the 1575 circuit. They are in the center of the below schematic. In the original circuit they are germanium transistors in a place where germanium seems to actually be a better circuit choice as will be explained. It is an unusual circuit I have only seen a few times in my life and the way it works is subtle. 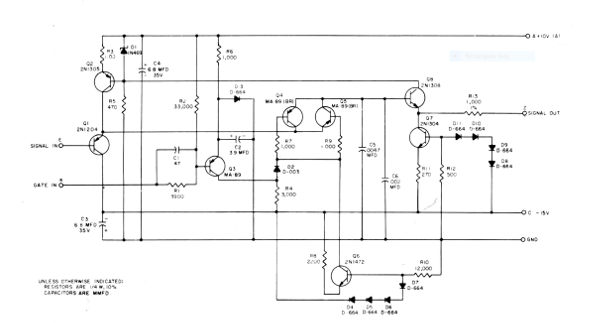 It is used to switch a voltage under very specific requirements. It is fascinating because it seems to work better than it should and some thought on transistor physics is needed to understand why. I will be implementing two missing DEC 340 Digital to Analog converters and a 1575 type circuit takes the voltages produced by these D to A converters to feed downstream amplifiers. But first I’ll describe the basic operation of the DEC 340 and how it differs from the later computer monitors which became the mainstream standard for many years. Our first floor ‘Tennis for Two’ exhibit has a new scope. Not really new though because chronologically it is lots older than the scope we were using. We had been using a Tektronix 465 scope which dates from no earlier than 1972. I remember this oscilloscope model well as I had one exactly like it on my bench at a previous job as ‘my scope’. 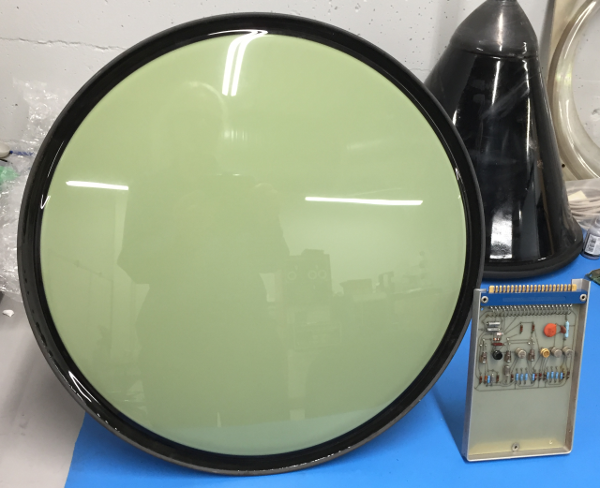 The Tektronix 465 which had been displaying Tennis for Two was made at least 14 years after Tennis For Two had been invented. Not an ideal situation for a display certainly, but a lot better than no oscilloscope at all which was our alternative. It took a while to acquire and restore a period appropriate scope. 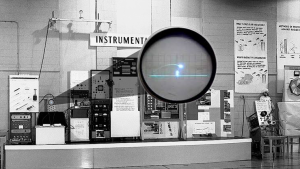 I wanted to use the same model oscilloscope which had displayed Tennis for Two when it made its debut at Brookhaven National Labs back in 1958 but which scope was it exactly? All I had to go on was this photograph. The Tennis for Two oscilloscope is on the left side of the instrument stage. This next photo shows exactly where. This is actually two photographs photo-shopped together and the scope image detail portion was not photographed in 1958. Enlarging a photo does not produce the detail shown above. The original photo is black and white and the enlargement is in color. Obviously two photos were combined. Beyond the obvious in the original ‘Blade Runner‘ movie Agent Deckard used a device which allowed him to zoom in on a photograph without loss of picture quality no matter what the magnification. In real life that is simply not possible. In real life the ‘replicant’ from the Blade Runner movie would have lived another day safe from Dekard for this is what you get upon enlargement of our scope in the Tennis for Two photo. Loss of detail. The photo is too fuzzy to make out the white DuMont label just below the display screen in the photo center or a model number. You can’t even tell where these labels are. I had to look at the photos of countless old scopes to make a match. It turned out the diamond pattern of the central knobs below the screen is very distinctive and only DuMont scopes of Dumont ‘304’ model type have that pattern. Upon identifying the type of scope it was I was able to find one on E-Bay and restore it. 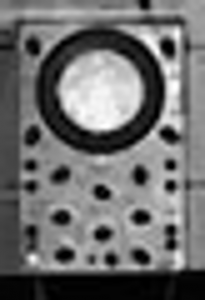 After physically acquiring the oscilloscope certain features in my fuzzy photograph such as the white DuMont Label made sense. Without a real scope to compare it to these features would have remained a mystery. Restoration involved replacing almost every capacitor in the scope which could have age related issues before I turned it on. That is not all but most of them. Minor troubleshooting then was able to get the scope to work. The vertical Amplifier had a bad connection on a calibration switch which would not let the vertical amplifier signal pass. As we don’t need to use the calibration switch I simply bypassed the connection. If we were to ever calibrate this oscilloscope we would not use the internal calibration signal and would provide an external calibration signal anyway. Here is the final result with the enlarged photograph I pasted on my office wall while I researched scope pictures. The shapes on some of the knobs are different but that is OK. DuMont mixed round knobs with pointed knobs of the ‘crows feet’ variety frequently. The scope we are using now and which I show here is an enhanced ‘304’ type called a DuMont 9559 and has options for doing RF measurements. I also acquired a plain Jane DuMont ‘304’ which has all crows feet type knobs. Physically the front panels are identical otherwise. What matters most is not that the knobs absolutely match but that we now display Tennis for Two on a period appropriate oscilloscope. The scope I restored was in better overall condition between the two I had acquired and I suspect Brookhaven used top of the line models in their research. We really can’t know what the exact model used was so the Dumont 9559 is an appropriate choice. Decaffeinating the TRS-80 video Display. prompt as it waits for user input. Our problem is that the prompt rapidly vibrates back and forth making the prompt nearly illegible besides being simply annoying. the monitor acts like it has been drinking massive amounts of coffee and is on a serious caffeine buzz. The screen vibrates because interference produced by a TV used as a monitor in an Atari 400 exhibit placed directly behind the TRS-80 video monitor is turned on. Turning off this Atari 400 exhibit monitor makes the TRS-80 display jitter vanish. The Atari and TRS-80 exhibits are back to back from each other in separate rows of our personal computer display. They are separated by enough distance that signal interference should not be a problem. Other arrangements of the many computer/monitor combinations in our personal computer exhibit were placed behind the TRS-80 video display and these other monitors produced the same interference as the Atari 400 TV does. That other monitors from other systems produced the same jittery result shows that the problem lies with the TRS-80 monitor and not the other monitors. This monitor is apparently too sensitive to low frequency magnetic interference produced by other monitors if they are placed a couple of feet away. We had discovered that a bare aluminum plate (made for a rack mount enclosure cover) about a tenth of an inch thick, totally stopped the jittery text when placed several inches behind the TRS-80 model 1 video monitor. The plate needed to be in between the TRS-80 display and the interfering monitor and placed in exactly the right place to be effective. The aluminum plate solution suggested that lining the inside of the TRS-80 video monitor cover with copper foil and tape should also eliminate the jitter problem. I attempted to do this both with and without a ground lead to the added copper foil shielding. Both my attempts were a miserable failure. The foil tape has conductive adhesive between layers but apparently the resistance between sections was still too high to allow sufficient eddy currents to form which would stop the magnetic field from penetrating into the video monitor electronics. That is my supposition and the story I was telling myself but before attempting to improve the shielding I decided to find out more about the TRS-80 display. 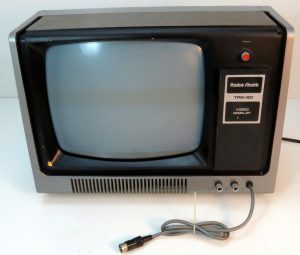 It turns out that the TRS -80 model is actually a modified RCA TV made in 1977. I found a picture of the particular model. Comparing this with a TRS-80 Model I video monitor the connection is obvious. 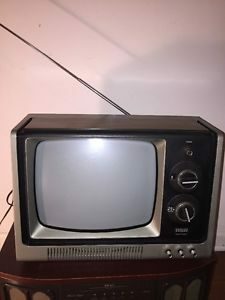 The tuner from the original TV set was removed in the conversion. 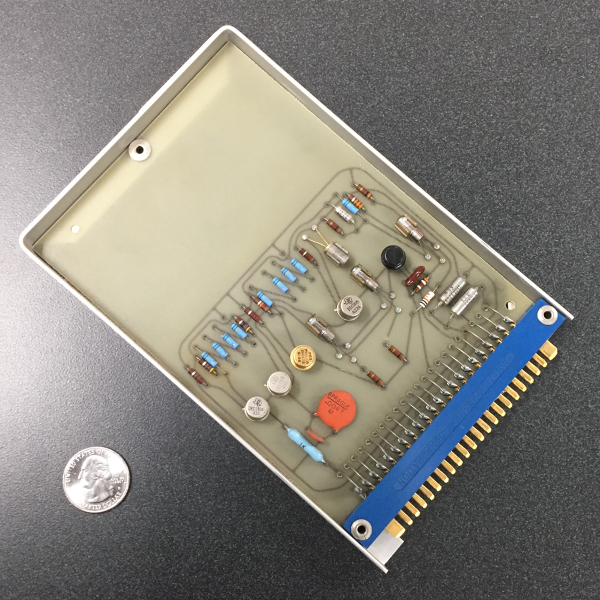 A circuit board that buffers the video signal from the TRS-80 was put in its place. There is a connector for the tuner on the main TV circuit board and the replacement board simply plugs into this location. Having seen the insides of enough old TVs, tuner sections were always wrapped in sheet metal to prevent interference. However, this precaution (and necessity) was not observed when replacing the tuner with the TRS – 80 video display custom circuit board. It appears no consideration was given to making this circuit board noise immune. The typical things I know which should be done to make a noise immune circuit board were not done. I could modify the circuit board so the problem pretty much goes away but I need schematics to do that. Currently we do not have any. I would adjust impedances so the relatively weak interference signal is effectively shunted to ground. I would essentially be finishing an unfinished job from 1977. An alternative would be to mount the aluminum plate solution permanently and document why it is there for visitors. Upon sharing my findings with the museum staff, it was decided I should work with Aaron Alcorn and implement the aluminum plate solution. I met with Aaron at our second floor exhibit. I explained that the problem was dependent on height and that lifting the TRS-80 display off its base would make the problem go away. The TRS-80 display had been sitting on a plastic base to elevate it a few inches above the TRS-80 keyboard for easy viewing. Aaron immediately lifted the display and removed the elevating platform. This had not been tried before. The problem immediately went away. Aaron solved the problem in ten seconds. It turns out the elevating platform was not all plastic. On its top was a thin layer of steel sheet metal. This sheet metal had been coupling interference into the video display. I think my supposition that the TV to TRS-80 computer monitor conversion had not been fully worked out is still correct but it is also true that placing a TRS-80 monitor in close proximity to another monitor on a steel table was not a typically anticipated operating environment for a TRS-80 computer monitor. The TRS-80 had been intended to be used as a home computer all by itself. In a karmic twist to this story the TRS-80 model 1 was discontinued because it could never be made to pass FCC RF emission standards. About 250,000 Model 1 systems were produced before it had to be discontinued, five times the original sales target. The TRS – 80 was an antisocial computer not designed to be used around other computers. 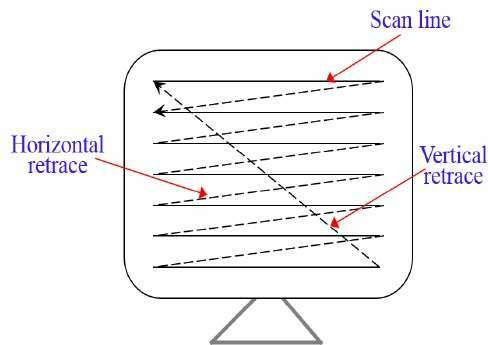 It was electrically noisy itself yet also hypocritically overly sensitive to electronic noise from other computer monitors. 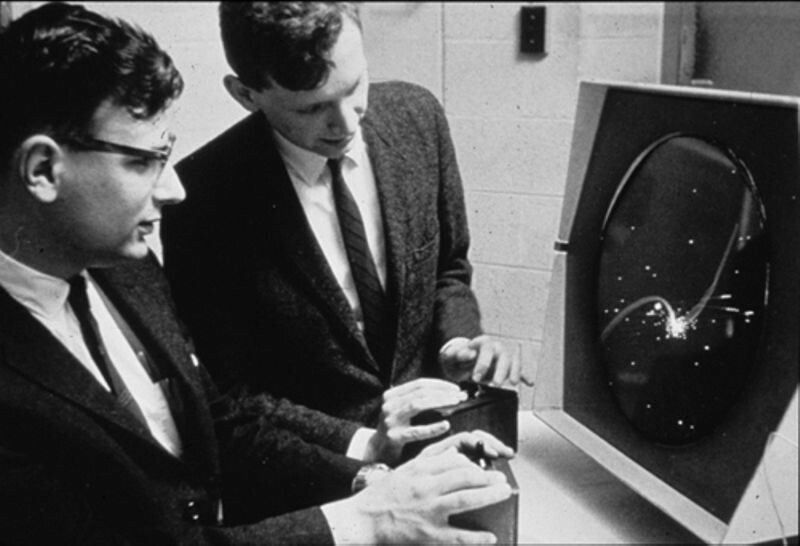 It was however a very early personal computer and exposed many people to computing for the first time. That is its particular historical significance. I remember it originally used large 8 inch floppy disks in its original floppy drive. As smaller 5 ¼ inch floppies had been introduced in 1976 I found that strange, but I suspect at the time it was the cheaper way to go. It has been said that the TRS-80 computer did everything ‘OK’ but nothing really really great. It appears that the particular video monitor design issue we discovered supports this view. But while it may have been flawed, the TRS-80 was also affordable and brought the joy of computing to many for the first time. 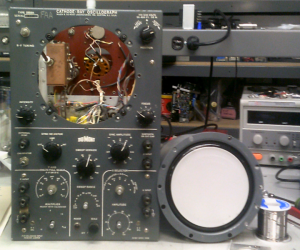 As I finish up some high priority tasks I think about the old oscilloscope I am fixing. I hope to spend some time working on it today. It is one of many interesting and fun jobs I get to do at the museum. Since the beginning of the year I have been quite involved with old oscilloscopes at the museum and I confess it has been a guilty pleasure of mine. A guilty pleasure because I have wanted to restore an old oscilloscope for a very long time. Far longer than I have been working at the museum and this old desire makes me forget I have legitimate reasons for restoring old scopes here and so brief twinges of guilt come to me and I have to remind myself that what I am doing is OK. The oscilloscope tube has been removed so I can get access to parts inside the scope I need to change out. Old scopes don’t seem to have much to do with vintage computers at first but if you think about them a bit you see that spending time on old oscilloscopes in a computer museum is appropriate. Oscilloscopes are the original visual output device for electronic computers and computers as we know them could never have been built without oscilloscopes. Oscilloscopes have been an essential tool for seeing what happens inside electronic circuits since the electronic age began. Without being able to see inside of and understand how electronic circuits work, computers as we know them would never have been built and compared to where we are now the highly technically advanced world we live in would resemble a stone age had they never been invented at all. The cathode ray tube used in oscilloscopes was invented in 1897 by Karl Ferdinand Braun. 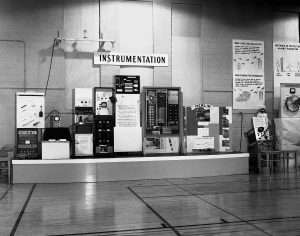 The A. C. Cosser company first started selling oscilloscopes in 1932. The scope I am working on now and which I show was made in the 1950’s. Not everyone is interested in old oscilloscopes and I have never seen an ‘I Love My Old Scope‘ bumper sticker on a car anywhere but I am not alone in my passion. Several videos have been posted on You Tube showing people repairing old oscilloscopes. Some of us apparently like old oscilloscopes the way most dogs like a thrown ball and I suspect seeing a few working oscilloscopes can make a visit to our museum more memorable. My guilt is shared by the old scope video makers. Their guilt usually makes them come up with a plausible explanation of why they are doing what they are doing. Just doing it does not seem to be OK but it should. I have watched a couple of the You Tube videos recently which confirmed some facts I also discovered in my own journey into the world of oscilloscope repair. I would have benefited by watching some of these videos in the beginning of my journey and will relate what I have learned from them and in my own activity in the future. One video in particular had a rather humorous moment. When any piece of electronic equipment is first powered up and nothing bad happens the equipment is said to have passed the ‘smoke test’ because nothing burned up and none of the vital smoke inside of the electronic parts so necessary for correct equipment operation is let out. The narrator of the video had a thick east coast accent further colored by the crackling voice acquired from years of cigarette smoking. The narrator powered up his oscilloscope and announced his scope ‘has passed the smoke test‘. As soon as the narrator said this he then had an intense coughing fit too authentic to possibly have been staged. When he was done coughing the narrator then said ‘which is more than you can say about me‘. The smoke test is performed after certain parts inside the oscilloscope have been changed out and replaced with new parts. I have discovered the condition of a scope restoration candidate varies depending on how the oscilloscope has been stored (temperature and humidity) and on the quality of components used. Scopes varied in quality and capability and this also affects how well they survive the years. The external appearance of an old scope my be very good but if the scope has aged in an unfriendly environment many components inside will have to be replaced before a smoke test should be done. An un-restored scope may power up and appear to work fine but I have learned such scopes will fail components very quickly and then stop working. I have learned that the statement ‘scope powers up’ in eBay ads does not tell the whole story because even if the scope works some components are old and ready to fail making the scope unreliable. 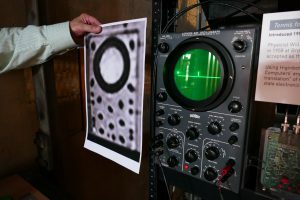 The particular scope I show in this post will be used to display a reproduction of what is considered to be the first video game ever, ‘Tennis for Two’ and has been selected because I believe this is the same model of oscilloscope used to display the original ‘Tennis for Two’ game way back in 1958 or a model very close to it. 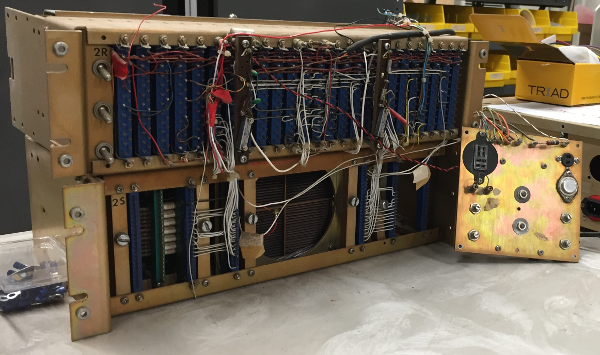 I will be describing what I have been doing to restore this scope and the general steps of what needs to be done to restore old oscilloscopes to working condition in a future post.